Hi there, we are the Polk County FFA Federation officer team! We have the opportunity to work with students across Polk County through chapter programs, the Polk County Youth Fair, and at leadership conferences. This year as an officer team, we decided to implement two service projects to help members of the community, as well as advocate for agriculture through literacy. As many know, the FFA motto states “Learning to do, doing to learn, earning to live, living to serve”. This is something that we all took to heart the moment we became FFA members, and the moment we were elected to serve our local members and teachers. 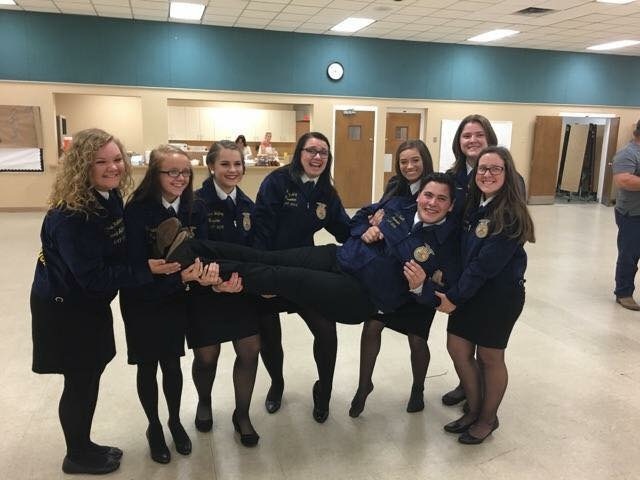 In 2016, 57 students loaded a bus and headed to the National FFA Convention in Indianapolis where they had the chance to hear a speech presented by Brad Montague. While there they got to hear an inspiring story for a young boy who, at the age of 12, wanted to make a difference by naming himself “Kid President”. Wanting to make a positive change, he started a fundraiser collecting socks during the month of October to prepare for the colder months soon to come naming the month “Socktober”. Inspired by this idea, the Polk County Federation team found a similar need in our community to collect socks, blankets, and jackets to create our own rendition of “Socktober”. This was perfect timing after a long 12 years without winter in Polk County. We extended the Socktober drive over two months to allow students time to collect as many items as possible to make it more impactful within the county. With the extension of the project, we ended up collecting 80 jackets, 371 pairs of socks, and 43 blankets at our district eight Christmas party where we counted and loaded up all donated items. The federation later delivered the contributions to local homeless shelters in the county to help them survive the cold months ahead. Just like Kid President, we are making a small change while making a big impact! Teachers and FFA members, are you looking to receive some MAD points for your chapter? The Making A Difference Award (MAD) is an award given to a chapter that has made an impact in their community through the work of numerous service projects. At the end of the year the federation will count all points for your chapter allowing you to compete for a trophy. This year we are holding a book drive for Ag Literacy Day. The drive is to collect agriculture books for children to help teach younger generations the importance of agriculture. Each chapter is asked to collect books and will receive five points per book collected. These books will be used to read to children in conjunction with the book provided by Florida Agriculture in the Classroom on Ag Literacy Day which will be on May 1. The purpose we intended for this service project was to inspire and advocate for the agriculture industry. Schools are encouraged to utilize FFA members to collect the books and read to the local elementary schools. The Federation team will also be reading to schools across Polk County. Our goal is to donate each book collected to various elementary classrooms to add agricultural books to their library. It is our job as FFA members to instill a confidence in consumers by teaching younger generations and future consumers about the many areas of agriculture. We hope to also inspire young students to pursue agriculture as they enter middle and high school by displaying positive leadership skills and mentorship through our time in the classroom.